Research focus: Studies of ocean physics and climatology, with emphasis on developing new applications of remote sensing. Gary Lagerloef began his career in oceanography as an undergraduate and obtained his Bachelors Degree from Florida Institute of Technology (1971). In the years 1972-1975, he served in the U.S. Coast Guard where he taught marine science at the Coast Guard Academy while earning a Masters Degree in Oceanography at the University of Connecticut. He spent the next nine years working for NOAA, about half that time as a seagoing officer on research ships in the Pacific and half at the Pacific Marine Environmental Laboratory (PMEL) in Seattle, WA where he met his wife, Marcia. 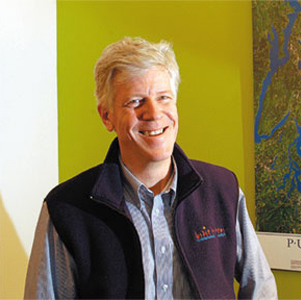 Dr. Lagerloef completed a Ph.D. in Physical Oceanography at the University of Washington in 1984 and later worked in private sector marine science. From 1988-1990, he served as Physical Oceanography Program Manager at NASA in Washington DC in the ocean science remote sensing program. In 1995, he co-founded Earth and Space Research, a non-profit scientific research institute in Seattle where he has developed several research projects devoted to studies of the upper ocean dynamics and climate variability using satellites. In December 2003, Dr. Lagerloef was appointed by NASA to lead the Aquarius/SAC-D satellite mission as Principal Investigator (launch date in 2009). He played a major role in gaining approval for this program, which will study the interactions between the ocean circulation, global water cycle and climate by measuring ocean salinity from space. The Aquarius mission is being developed in an international partnership with Argentina’s space agency, Comision Nacional de Actividades Espaciales, and is the first NASA satellite mission dedicated to measuring ocean salinity. Dr. Lagerloef officially retired from ESR on December 31, 2017 and will continue his ocean salinity research now as a Scientist Emeritus. M.S. (1975) University of Connecticut (Oceanography). Ph.D. (1984) University of Washington (Physical Oceanography). Melnichenko, O., P. Hacker, N. Maximenko, G. Lagerloef, and J. Potemra, 2016. Optimum Interpolation Analysis of Aquarius Sea Surface Salinity, J. Geophys. Res.-Oceans, 121 (1), 602-616, doi: 10.1002/2015JC011343. Johnson, G.C., J. M. Lyman, G. S. E. Lagerloef, and H.-Y Kao, 2015. [Global oceans] Surface salinity [in “State of the Climate in 2014”]. Bull. Amer. Meteor. Soc., 96 (7), S71–S74. Johnson, G.C., J. M. Lyman, G. S. E. Lagerloef, and H.-Y Kao, 2014. [Global oceans] Surface salinity [in “State of the Climate in 2013”]. Bull. Amer. Meteor. Soc., 95 (7), S60–S65. Kao, H.Y. and G.S.E. Lagerloef, 2015. Salinity Fronts in the Tropical Pacific Ocean, J. Geophys. Res.-Oceans, 120 (2), 1096-1106, doi: 10.1002/2014JC010114. Dohan, K., H.-Y. Kao, and G.S.E. Lagerloef, 2015. The freshwater balance over the North Atlantic SPURS domain from Aquarius satellite salinity, OSCAR satellite surface currents, and some simplified approaches. Oceanography, 28(1), 86–95, http://dx.doi.org/10.5670/oceanog.2015.07. Melnichenko, O., P. Hacker, N. Maximenko, G. Lagerloef, and J. Potemra, 2014. Spatial Optimal Interpolation of Aquarius Sea Surface Salinity: Algorithms and Implementation in the North Atlantic, J. Atmos. Oceanic Tech. Johnson, E.S., F. Bonjean, G.S.E. Lagerloef, J.T. Gunn, and G. T. Mitchum, 2007. Validation and Error Analysis of OSCAR Sea-surface Currents, J. of Atmospheric and Oceanic Technology, 24(4), 688-701. Cummins, P., G. Lagerloef and G. Mitchum, 2005. A regional index of northeast Pacific variability based on satellite altimeter data, Geophys. Rres. Lett., VOL. 32, L17607, doi:10.1029/2005GL023642. White, W.B., D.R. Cayan, P. Niiler, J. Moisan, G. Lagerloef, F. Bonjean, and D. Legler, 2005. The seasonal cycle of diabatic heat storage in the Pacific Ocean, Progr. Oceanogr., 64, 1-29. Cummins, P. and G. Lagerloef, 2004. Wind-driven interannual variability over the Northeast Pacific Ocean, Deep Sea Res. I, 51, 2105–2121. Font, J,. G.S.E. Lagerloef, D.M. Le Vine, A. Camps, O.Z. Zanife, 2004. The Determination of Surface Salinity with the European SMOS Space Mission, IEEE Trans. Geossci. Rem. Sens., 42, 2196-2205. Lagerloef, G., 2004. Satellites to address Ocean and Land Hydrology, EOS Trans. Am. Geophys. Un., 42, 419-421. Koblinsky, C. J., P. Hildebrand, D. LeVine, and F. Pellerano, Y. Chao, W. Wilson, S. Yueh, G. Lagerloef, 2003. Sea surface salinity from space: Science goals and measurement approach, Radio Science, 38, 4, 8064, doi:10.1029/2001RS002584. Lagerloef, Gary, Roger Lukas, Fabrice Bonjean, John T. Gunn, Gary T. Mitchum, Mark Bourassa, Antonio J. Busalacchi, 2003. El Niño Tropical Pacific Ocean surface current and temperature evolution in 2002 and outlook for early 2003. Geophysical Research Letters, 30(10), 1514, doi:10.1029/2003GL017096. Bonjean, F., and G.S.E. Lagerloef, 2002. Diagnostic model and analysis of the surface currents in the tropical Pacific Ocean, Journal of Physical Oceanography, 32, 2938-2954. Cummins, P. and G.S.E. Lagerloef, 2002. Low frequency pycnocline depth variability at Station P in the northeast Pacific, Journal of Physical Oceanography, 32, 3207-3215. Johnson, E. S., G. S. E. Lagerloef, J. T. Gunn, and F. Bonjean, 2002. Salinity advection in the tropical oceans compared to atmospheric freshwater forcing: a trial balance, J. Geophys. Res., 10.1029/2001JC001122. Lagerloef, G. S. E., 2002. Introduction to the special section: The role of surface salinity on upper ocean dynamics, air sea interaction and climate, J. Geophys. Res., 107(C12), 8000, doi:10.1029/2002JC001669. Picaut, J., E. Hackert, A. J. Busalacchi, R. Murtugudde and G. S. E. Lagerloef, 2002. Mechanisms of the 1997-1998 El Nino-La Nina, as inferred from space-based observations. J. Geophys. Res., 107(C5), 10.1029/2001JC000850. Lagerloef, G. and T. Delcroix, 2001. Sea surface salinity; a regional case study for the tropical Pacific, Observing the Oceans in the 21st Century; a strategy for global observations. C. Koblinsky and N. Smith, Eds., GODAE Project Office, Bureau of Meteorology, Melbourne, Australia. 604 pp. Lagerloef, G.S.E., 2001: Satellite Measurements of Salinity, in Encyclopedia of Ocean Sciences, J. Steele, S. Thorpe, and K. Turekian, Eds, Academic Press, London, 2511-2516. Lagerloef, G.S.E., 2000. Recent progress toward satellite measurements of the global sea surface salinity field, Satellites, Oceanography and Society, D. Halpern, ed., Elsevier Oceanography Series, 63, 367 pp. Lagerloef, G. and T. Delcroix, 1999. Sea surface salinity observations for the Tropical Pacific, CLIVAR Exchanges, v4, n3, pp5-10. Lagerloef, Gary S.E., Gary T. Mitchum, Roger B. Lukas and Pearn P. Niiler, 1999. Tropical Pacific near-surface currents estimated from altimeter, wind, and drifter data, J. Geophys. Res., 104, 23,313-23,326. Dickey, J.O., C. Bentley, R. Bilham, J.A. Carton, R.J. Eanes, T.A. Herring, W.A. Kaula, G.S.E. Lagerloef, S. Rojstaczer, W.H.F. Smith, H.M. Van den Dool, J.M. Waher, M.T. Zuber, 1999. Gravity and hydrosphere: New frontier, Hydrological Sciences J., 44, 407-415. Dickey, J.O., C. Bentley, R. Bilham, J.A. Carton, R.J. Eanes, T.A. Herring, W.A. Kaula, G.S.E. Lagerloef, S. Rojstaczer, W.H.F. Smith, H.M. Van den Dool, J.M. Waher, M.T. Zuber, 1998. Satellite gravity: Insights into the solid earth and it fluid envelope, EOS Trans. Amer. Geophys. Union, 79, 237, 242-243. Lagerloef, G., R. Lukas, R. Weller and S. Anderson, 1998. Pacific Warm Pool Temperature Regulation During TOGA COARE: Upper Ocean Feedback, J. Climate, 11, 2297-2309. National Research Council, Committee on Earth Gravity from Space (Dickey, J.O., C. Bentley, R. Bilham, J.A. Carton, R.J. Eanes, T.A. Herring, W.A. Kaula,G.S.E. Lagerloef, S. Rojstaczer, W.H.F. Smith, H.M. Van den Dool, J.M. Waher, M.T. Zuber), 1997. Satellite Gravity and the Geosphere: Contributions to the Study of the Solid earth and Its Fluid Envelope, 112 pp., National Academy Press, Washington DC. Lagerloef, G., R. Lukas, R. Weller and S. Anderson, 1996. Pacific warm pool sea surface temperature regulation as indicated by a stochastic forcing model and TOGA COARE measurements, In: Proceedings of the eighth Conference on Air-Sea Interaction, Am. Met. Soc. Lagerloef, G., C. Swift and D. LeVine, 1995. Sea surface salinity: The next remote sensing challenge, Oceanography, 8, 44-50. Lagerloef, G., 1995. Interdecadal variations in the Alaska Gyre, J. Phys. Oceanogr., 25, 2242- 2258. Lagerloef, G., 1995. The ENSO signal in the Alaska Gyre circulation; atmospheric or oceanic teleconnection?, In: Proceedings of the International Scientific Conference on the TOGA Programme, WCRP-91, WMO/TD No. 77. Lagerloef, G.S.E., 1994. An alternate method for estimating dynamic height from XBT profiles using empirical vertical modes, J. Phys. Oceanogr., 24, 205-213. Bhaskaran, S., G.Lagerloef, G.Born, W.Emery and R.Leben, 1993. Variability in the Gulf of Alaska from Geosat altimetry data, J. Geophys. Res., 98, 16,311-16,330. Koblinsky, C., P. Gaspar, G. Lagerloef, editors, 1992. The future of spaceborne altimetry: Oceans and Climate Change, Joint Oceanographic Institutions Inc., Washington, D.C., 75pp. Lagerloef, G.S.E., 1992. The Point Arena Eddy: a recurring summer anticyclone in the California Current, J. Geophys. Res., 97, C8, 12,557-12,568. Lagerloef, G.S.E., and R.L. Bernstein, 1988. EOF analysis of AVHRR surface temperature patterns in Santa Barbara Channel, J. Geophys. Res., 93, C6, 6863-6873. Lagerloef, G.S.E., 1987. Comment on “On the joint distribution of surface elevations and slopes for a nonlinear random sea, with an application for radar altimetry” by M.A. Srokosz, J. Geophys. Res., 92, 2985-2987. Lagerloef, G.S.E., and R.D. Muench, 1987. Near inertial current oscillations in the vicinity of the Bering Sea Marginal Ice Zone, J. Geophys. Res., 92, 11789-11802. Muench, R.D., G.S.E. Lagerloef and J.D. Gunn, 1986. 1984-85 current observations in the East Greenland Current: A preliminary description. MIZEX Bulletin VII, US Army Cold Regions Research and Engineering Laboratory Special Report 86-3, pp 41-53. Cannon, G.A. and G.S.E. Lagerloef, 1983. Topographic influences on coastal circulation: A review. In Coastal Oceanography, H. Gade, A. Edwards and H. Svendsen, Eds., Plenum Publishing. Lagerloef, G.S.E., 1983. Topographically controlled flow around a deep trough transecting the shelf off Kodiak Island, Alaska. J. Phys. Oceanog., 13, 139-146. Lagerloef, G.S.E., R.D. Muench and J.D. Schumacher, 1981. Low frequency variations in currents near the shelf break, northeast Gulf of Alaska. J. Phys. Oceanog., 11, 627-638. Gunn, J., and G. Lagerloef, Report of large scale wind patterns in the Tropical Pacific via EOF and CCA analysis of NSCAT and TAO array data. SSIWG-1 Report: Preliminary Assessment of the Scientific and Technical Merits for Salinity Remote Sensing from Satellite, Final Report of the First Workshop, Salinity Sea Ice Working Group (SSIWG), La Jolla, CA, USA, 7-8 February 1998. SSIWG-2 Report: Progress Toward Salinity Remote Sensing Satellite Missions, Report of the Second Workshop, Salinity Sea Ice Working Group (SSIWG-2), NASA Goddard Space Flight Center, Greenbelt MD, USA 19-21 April 1999.